Green supporters often say their party is ignored by the media. The proposal to exclude Natalie Bennett from the leaders’ debates triggered the latest protests, but this is a long-running argument. In particular, Greens point to the coverage that Ukip get, which they say is much more than the Greens get, and unfairly so. I’ve never been quite convinced by this. 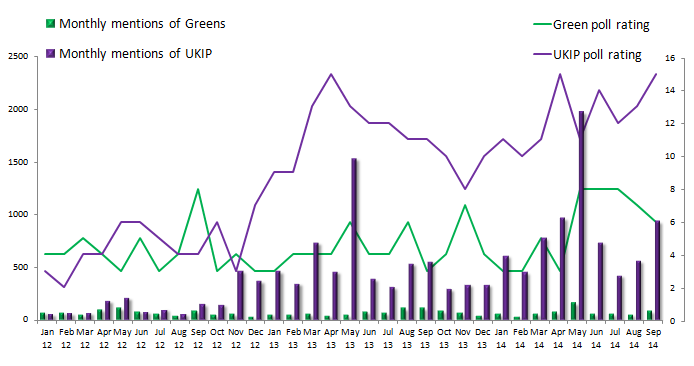 Ukip have at least twice the popular support of the Greens, so it seems natural that they should get more coverage. But now I’ve measured how much coverage each party gets, I’ve realised I was wrong. Even after factoring in their relative levels of popular support, Ukip get several times more coverage than the Greens. 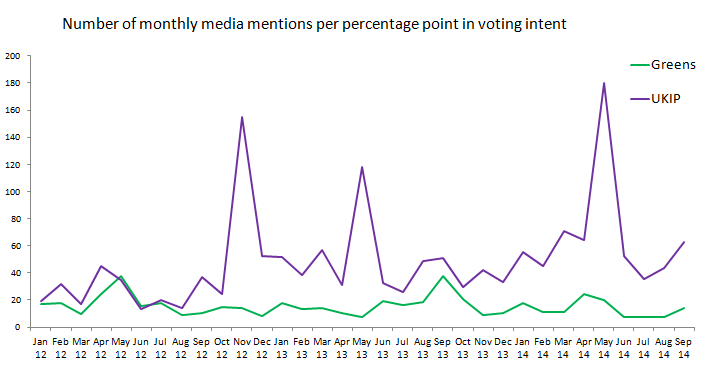 I’ve searched for how many times Ukip and the Green Party were mentioned by UK national newspapers each month since January 2012* – and compared it with the voting intent for both parties in the Ipsos Mori monthly political monitor. What we really want to know, though, is how proportionate the coverage is to each party’s popular support. Dividing the number of mentions by the parties’ poll ratings gives a sort of conversion score: how many articles they get for each percentage point of popular support they have. Using this we see that Ukip get far more coverage relative to their support than the Greens do. This chart divides the number of media mentions by each party’s poll score at the time – so if their coverage was proportionate to their support, the lines would be the same height. It’s interesting to look at this in three distinct phases. What do the public think about climate change? Posted in Climate Sock, Energy sources on October 14th, 2014 by Leo – Comments Off on What do the public think about climate change? I was recently asked to give a summary presentation of public opinion about climate change and energy. 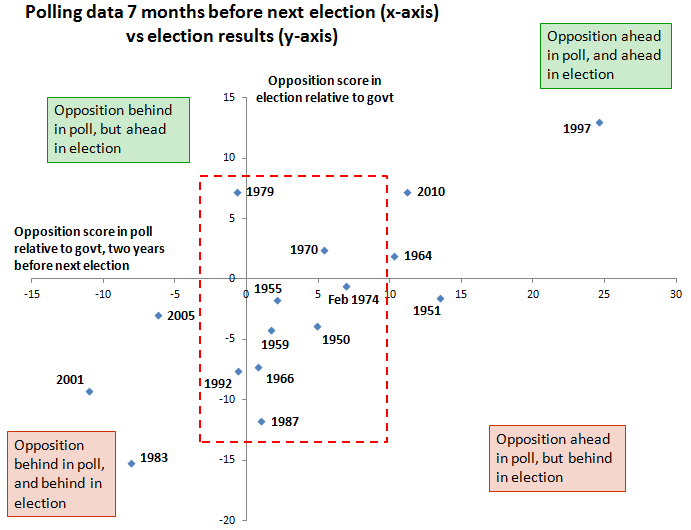 Seven months until the General Election it’s time for an update of my chart of what historical polls and votes can tell us about the election ahead. The earlier posts are available here, including discussions of the methodology. As ever, I’m using Mark Pack’s brilliant spreadsheet of historical polls. According to UK Polling Report, Labour’s current lead is 4pts. This means the analysis suggests a Tory lead after the election of just under 2pts: probably not enough for a majority, and with Labour the largest party. This is almost exactly the same prediction as from polls a year before elections. It is also similar to – though marginally better for the Tories than – the prediction from polls two years before elections. But now focus on the elections in the area in the red box below: where the polls were narrow at this stage. 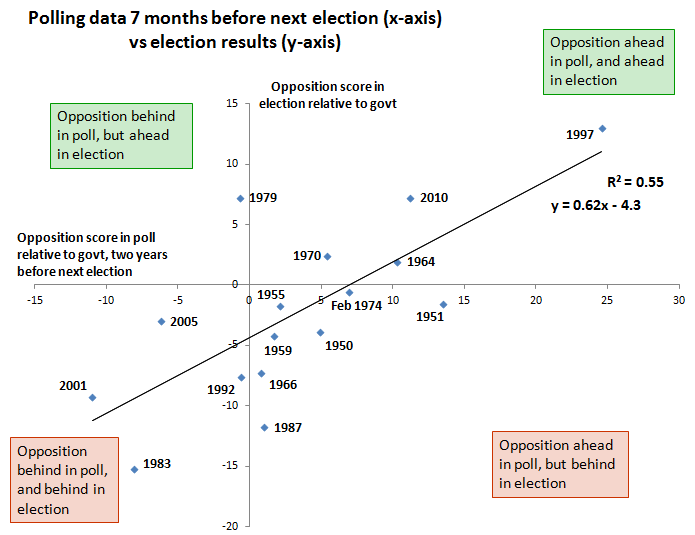 In these cases there is a huge amount of variation in the results: from a healthy Opposition victory (’79) to a comfortable Government majority (’87). So from where we are now, previous elections suggest either main party could build a majority-sized lead. That said, the fact the polls have followed the historical trend for at least the last 17 months provides some evidence to support the model’s prediction of a very small Tory lead.